Toiling away above Frith Street, with financial help from his family and a £200 donation from a private benefactor, John Logie Baird struggled with his invention for many months. For his experiments, he used an old ventriloquist’s dummy’s head; a character whom he nicknamed ‘Stooky Bill’. ‘Stooky Bill’ one of the earliest stars of television! However, try as he might, the Scottish inventor just could not get the image of his plaster prop to appear on the televisor’s wee screen. As autumn set in, Logie Baird had been at Frith Street for almost a year, yet his invention seemed to be going nowhere. “Funds were going down, the situation was becoming desperate and we were down to our last £30 when at last, one Friday… everything functioned properly. Almost immediately, Logie Baird wanted to test his televisor on a living, breathing human being. In a sudden burst of energy, he dashed downstairs which, at that time, was home to an office belonging to a Mr Cross. Logie Baird asked if he could quickly borrow the office boy; William Taynton. William was quickly hauled upstairs and plonked in front of the camera. Wasting no time, John Logie Baird dashed over to the viewing screen… only to find it blank. What the inventor had failed to realise in his haste was that young William, being rather scared by the bright lights and rapidly whirring discs, had shied away from the camera! Persuasion was on hand though- in the form of half a crown. Taking this handsome payment in hand, William Taynton diligently sat where required… as the flickering image appeared on the screen, the young lad on the other side of the camera probably didn’t realise that he was going down in history as the first ever real-life T.V star! Shortly after this euphoric success, there was a knock at Logie Baird’s door… it was a group of Soho prostitutes who, having glimpsed the strange machine through a window, has mistaken it for a telescope- and demanded to know why the Scotsman was spying on them! Within a few months, John Logie Baird was ready to demonstrate his televisor to the public. On the 26th January 1926, at Frith Street, he gave the first showing to a group of guests from the Royal Institution. The demo, also beamed to guests at Olympia and at premises on Savoy Hill (behind the Savoy Hotel), included transmitted images of Stooky Bill and also of a real person. Following the first public demonstration, ‘Baird Television Limited’ was established, its headquarters moving a short distance from Frith Street to 133 Long Acre in Covent Garden. Further experiments were carried out at the new studio, each more ambitious than the last. In 1927 John Logie Baird successfully broadcast test images to his native Scotland; the receiving end being a televisor set based at Glasgow’s Grand Central Hotel. The following year, he also succeeded in beaming grainy images (of a man and woman sitting in his studio) across the Atlantic to New York. Experiments with colour and even 3D were also conducted. With these advancements, John Logie Baird knew that the time was ready to begin broadcasting to the public. In those days, the only broadcaster in the UK was the British Broadcasting Corporation; itself in its infancy (and, in those days of course, a radio station). Logie Baird approached the BBC’s director, John Reith and, after some persuasion, managed to get the corporation to give the new technology a try. Logie Baird had built a transmitter on the roof of his Long Acre premises, but he soon realised it would be too weak for his ambitions. He therefore needed to borrow one of the BBC’s aerials- known as ‘2LO’ which was located on the roof of Selfridges. However, 2LO’s primary use was for radio broadcasts, so the BBC only granted Baird Broadcasting access to the transmitter between 11pm and mid-morning next day, when wireless broadcasting was off-air. Selfridges continued to play an important role in the dawn of television when the first Baird ‘Televisor’ sets went on sale at the department store. With prices for the new equipment ranging from £20 to £150 (equivalent at the time to the price of a motor-car), only a handful of wealthy people in the London area were able to receive the new-fangled programmes. In fact, for the very first broadcast, Logie Baird himself estimated that only 30 people were tuned in! One of this select group was the Prime Minister himself; Ramsay McDonald, who watched the historical moment from 10 Downing Street on a Televisor which had been presented as a gift from the Scottish inventor. The very first programme was broadcast from Covent Garden’s Long Acre on the morning of 30th September 1929. Due to transmitter limitations, the sound and vision had to be broadcast separately in two minute bursts; so the viewer would first see a silent, flickering image with the crackling sound following shortly afterwards. This split process would continue for the first six months of programming. The very first televisual broadcast opened with a speech by Sydney Moseley; Logie Baird’s business manager and one of his most supportive friends. 11.16am. Sydney Howard: televised for two minutes. 11.18am. Sydney Howard: Comedy monologue. 11.20am. Miss Lulu Stanley: televised for two minutes. Morning television in those days was clearly far more sophisticated than the dross on offer today! On the 14th July 1930, Baird Television were finally able to broadcast the sound and vision together for the first time. The vehicle used for this demonstration was a short play called ‘The Man With the Flower in His Mouth’, which was written in 1922 by Italian playwright, Luigi Pirandello. Chosen for its simplicity and small cast (considerations which were driven by the tiny televisor screen), the short play is essentially a philosophical conversation in a café between a businessman who has just missed his train and another fellow who is suffering from a cancerous throat. The actors, who performed the play live at Long Acre, had to have their faces painted yellow, with navy blue shading around the eyes and nose. This bizarre makeup was intended to enhance their image on the shimmering receiving screens, which glowed a characteristic reddish-orange colour. In 1967, The Man with the Flower in His Mouth was painstakingly remade in an attempt to emulate what audiences back in 1930 would have seen. The recreation was supervised by the play’s original producer, and also includes the original artwork and gramophone music. 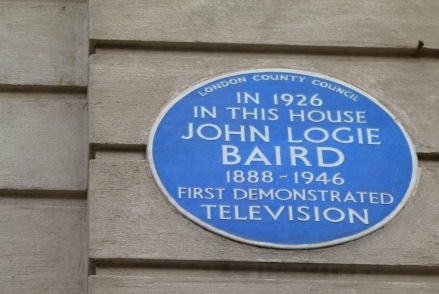 By late 1930, Baird Television’s Covent Garden studio was beaming 30 minutes of programmes in the morning; Monday to Friday and 30 minutes at midnight on Tuesdays and Fridays. In July 1933, Baird Television left Covent Garden and moved to Sydenham in deepest South London. Here, at the Crystal Palace complex, a new studio was established, with the antenna attached to one of the glass palace’s towers. John Logie Baird also made his own personal home in the area, on Crescent Wood Road, a short walk from the Crystal Palace studio. On 30th November 1936, the Crystal Palace burnt down, taking Baird Television studios with it. Two weeks later, before the ashes had even cooled, the BBC- who were now really starting to get into the T.V thing- announced that they were scrapping Baird’s system in favour of more modern equipment which had been developed by Marconi-EMI. The BBC moved their T.V wing to Alexandra Palace; the North London twin of the now vanished Crystal Palace. Television continued to remain an ultra-expensive luxury and, on the 1st September 1939, following a Mickey Mouse cartoon, test card and a preview of up and coming programmes, the service suddenly went off air; closed down by the government in anticipation of the World War which was about to erupt; the fear being that enemy aircraft would use the television signals to hone in on their targets. The first few years of television had come to an end, and the medium would not be seen again until 1946. Despite the cruel setbacks, John Logie Baird’s appetite for invention remained as strong as ever. The ingenious Scotsman went onto experiment with high definition colour, large-screen televisions, video recording devices and even made early ventures into infra-red. It is believed that, during WWII, Logie Baird carried out important work on the new radar network. John Logie Baird died at the age of 57 on June 14th 1946. This final clip, from 1937, shows the great innovator with the machine he forged in his Frith Street attic. Today, a working model of his revolutionary device can be still be viewed at the Science Museum in South Kensington. if your hosting is OK? Not that I’m complaining, but slow loading instances times will often affect your placement in google and can damage your high quality score if advertising and marketing with Adwords. Anyway I’m adding this RSS to my e-mail and can look out for a lot more of your respective intriguing content. Ensure that you update this again very soon.. There are a few problems with loading, it can be very frustrating! I’m looking into it. Thanks for the advice. The 26th January 1926 demonstration was not beamed to guests at Olympia and Savoy Hill. It was seen only at Frith Street 22, London.